Boca da Onça is one of the most traditional activities in Bonito MS Brazil's area and the only one in the waterfalls category with a rappel option! Those who do go rappelling begin the waterfalls nature walk activity in a completely different way, able to see the Salobra River Canyon from unforgettable points of view! After dropping down from the highest rappelling platform in Brazil to the meeting point, the rest of the activity includes all of the main places, such as Boca da Onça Falls (The tallest in the state of Mato Grosso do Sul), the support kiosk, Buraco do Macaco Falls (One of the most incredible falls you will visit) and the other falls along the nature walk's way. Boca da Onça literally translates to Jaguar's Mouth. The falls got the name due to the rock formation being shaped like a jaguar's mouth. Buraco do Macaco means Monkey's Hole and the place got its name because there literally is a hole you must swim through to get to these falls. If the training happens in town, then it must be done the night before the activity itself. Because the activity changes logistics based on the staff and the season, be sure to get this information from the agency when you arrive in Bonito. The details described below are based on the situation in which the training happens directly at the place, the day of, which is more common, but may not be your case. Children may be kept from doing this activity not based on age, but on size. The minimum weight requirement is 50 kg and height must be so that the safety equipment provided fits correctly. 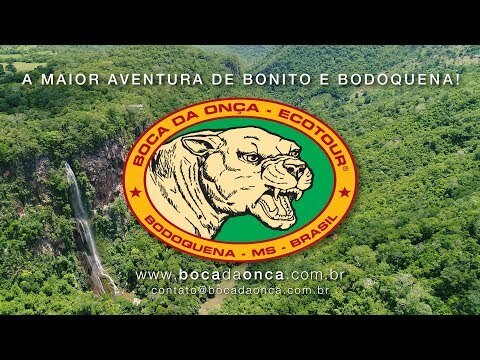 - Boca da Onça Waterfalls Nature Walk (It is the same activity as this, but no rappelling included.